Brows, Cosmetic Trends, Full Brows, Skinny Brows, Tips! The key to a long lasting and flawless make-up application is to prime. Similar to a state of the art paint job, in order to achieve color pay off and a lasting impression, it is recommended to use a primer. In the world of cosmetics, a primer serves as a base and usually has different functions, depending on the primer. We have primers for the face, eyelids and lips. Each primer has one thing in common, to coat and prep the skin for the next step, which is usually a make-up application. I will discuss my favorite primers. Primers that give ultimate “staying power”, color pay off and much much more! After applying moisturizer (I prefer a tinted moisturizer) and eye cream the very next step before applying make-up is priming. Some primers serve a dual purpose, as a moisturizer and a primer. I use a primer to reduce texture and fine lines and to extend the life of my make up application. My favorite primer is from Bare Escentuals. 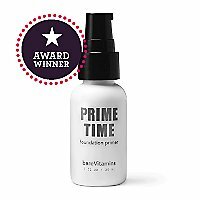 Prime Time, bareVitamins is an award winning primer. I use it on all my make-up applications. Primetime helps reduce the appearance of enlarged pores and uneven texture in your skin. It has vitamins C & E, and plant extracts to soothe your skin. It’s also preservative free. It feels WONDERFUL on your face. You only need a small amount and it leaves your skin feeling silky, smooth and matte at the same time. It creates a smooth canvas for your foundation to lay on. Primetime extends the life of your foundation, and it prepares your skin for a flawless make-up application. Before applying any eye cosmetics (eye shadow, eyeliner, mascara), I definitely recommend a primer. Because your eyes stay open at least 50% (mine stay open 75%) of the day or more, a primer helps your eye make-up stay put. It’s very important to know what type of skin you have around your eyes (your lid and under your eyes). This is going to help you pick a primer that caters specifically to your eye needs (meaning if you have oily lids you want a primer with oil absorbers). I have two favorite eye primers; MAC paints and MAC paint pot. If I need to wear my make-up ten plus hours, and for it to be totally crease resistant, I wear the MAC paints. It comes is a small metallic like tube Although the tube is small, a little goes a long way. MAC paints come in a variety of colors. So you have the option to wear it alone or enhance the color you put on top. Although you can wear it alone, I prefer it as a base. 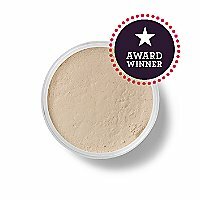 This product goes on creamy but dries to a powdery finish. It is very important that you apply a thin layer. My other favorite primer is the MAC paint pot. I use this product for its dual purpose. It also comes in a variety of colors and finishes (matte or slightly metallic). This product I sometimes wear alone. Because of the beautiful colors the paint pots are available in, I find myself sometimes wearing it as a primary shadow. My favorite colors are Indian wood (bronzy/gold) and Abstract (burgundy/wine). 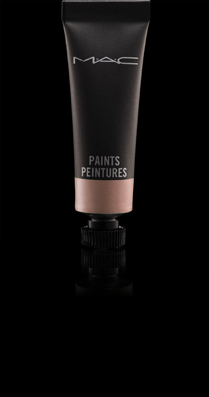 Paint pots can also be worn as a base to enhance any eye shadow color you choose to put on top. I recommend that you use shades that are similar to the base color. Paint pots are creamier in texture than MAC paints. They don’t dry down to a powdery finish, but the finish is still long wearing. I still recommend that you use a thin layer. It comes in a glass jar, and a little goes a long way, just remember to close the jar after every use. Have you ever had the most perfect red lipstick and after about an hour of wearing it, it starts to bleed or feather out? Because I am a huge fan of red lipstick (or any other rich pigmented color), this has happened to me several times. Although there are several products on the market, that claim to prevent feathering and bleeding, I still haven’t found the perfect lip primer for me. I have put together a recipe that works best for me. The first thing I do is use Mineral Veil powder, from Bare Mineral. I also recommend any loose blot powder or any kind of powder that has a form of oil absorbers (talc, silica, corn starch). I use a small amount of mineral veil buffed on my lips and around my lips. Then I line my lips with a pencil lip liner (not a roll up lip liner), the drier the lip liner the better. I then apply my lipstick, I try not to use glossy or moist textures. After I apply my lipstick, I slightly (very lightly) dust mineral veil again. I use a small amount of concealer on an angle brush and apply around my mouth (this defines your new red lips more and it helps prevents feathering, blend very well). Then I retouch my lip liner and place a small amount of red lip gloss in the center of my bottom lip. So overall, my primer for lips, are Mineral Veil and MAC studio finish concealer. This process makes my lipstick bullet proof and bleeding and feathering doesn’t happen. Not only will the trees be turning that burnt orange, copper and red, but Fall 2011 fashion, will be embracing and flaunting Ruby Red. So if you are shy and a little more conservative, switch it up please. Love thy RED, for the season! 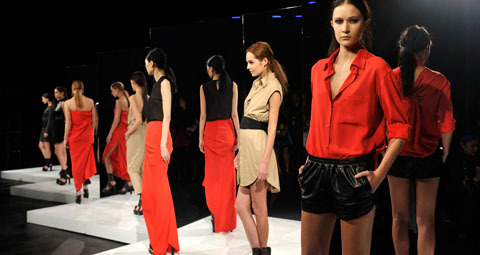 Please delight in the hot fall make-up trends of 2011, strutted down the runway of Fashion Week! 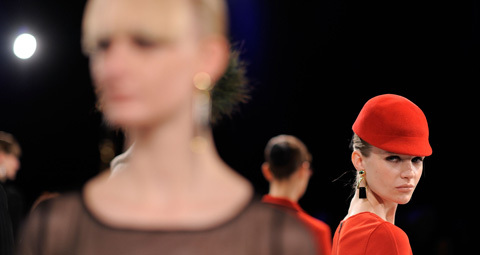 All different shades of RED coats the lips of fashion models. If not reds, deep pigments such as bordeaux, plums and wines. Not only are there rich pigments on the lips, you will notice bold eyes as well. 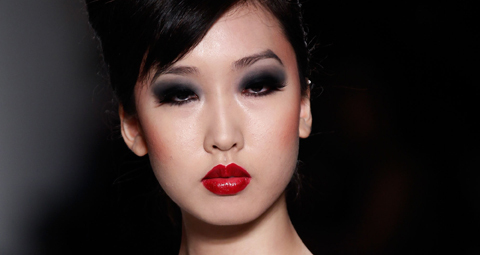 Smoky eyes, with winged out eyeliner…both eyes and lips competing for attention, bold vs. bold…are you ready for Fall 2011? Basic tips, and product suggestions on how to be Ruby Red with a hint of Smoke, for Fall 2011. Who says only the models can have this look? For that Rich Pigmented Lip– Crimson (red) (Bobbi Brown), Old Hollywood (red) (Bobbi Brown), Rouge Byzantin (red) (Chanel), Rouge Coco (deep red) (Chanel), Ruby Woo (red) ( MAC), Media (deep red/burgundy) (MAC), Musky Amethyst (plum) (MAC). Ok Brides, this is my take on these celebrity brides make-up. Please allow this to merely be used as a form of inspriration to help you narrow down your make-up look for your wedding. Do you want your make-up to read Elegance, Simplicity, Glamorous, Hot, etc. 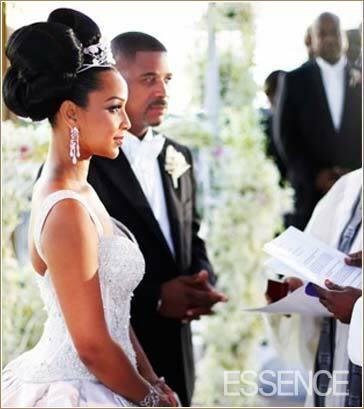 See how our celebrity brides are categorized! We first have to start to off with the new Duchess Kate Middleton. Kate Middleton’s Bridal make was a great example of Elegant and Fresh. Her Eyes extra smoky with a charcoal effect, everything else, light and fresh. Her brows were well defined and kept full. Her eye make is what helped light up her face. Her lids were sculpted with a charcoal like color and blended lightly to the crease to meet the natural color that highlighted her brow bone. Her eyes seem to be lined in the same charcoal color and mascara well defines her the bottom lashes. Her skin, fresh and matte with a hint of natural sheen. Her cheeks and lips a beautiful and pink. Because of the light ad rich cheek and lip color, it was the prefect balance for her smoky eye. The Duchess kept it Elegant and Fresh! 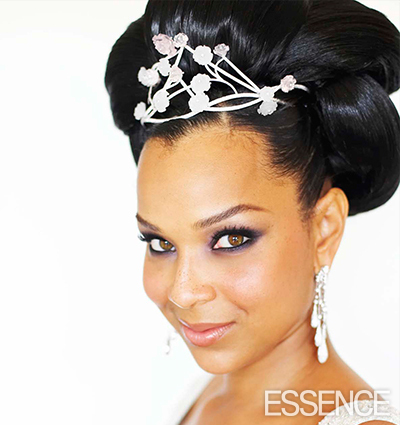 There are so many other celebrity brides that have commited to keeping their bridal make –up Fresh. They all have a different twist. 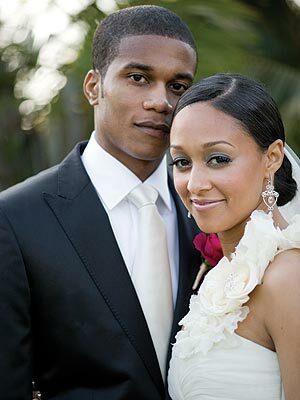 Let’s take the celebrity twins, Tia and Tamera Mowry, on their wedding day. 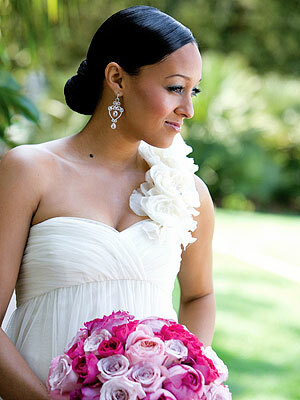 Tia Mowry- is a great example of Simple and Fresh! On her special day she did simple and fresh, from head to toe. Her hair beautiful and classic updo, pulled to the side and low. Her make- up, simple and fresh with a twist of mocha and champagne. Her eyes were perfect for this simple and fresh look. A hint of the mocha /champagne like color on her lids blended to the crease and a natural brow bone. Her brows, beautiful and contoured, and seem slightly lighter in color. I love that her brows are lighter because they don’t dominate her face but is a beautiful accessory. Her bottom lid has a drop of the same (mocha and champagne) color smudged lightly. She also has false lashes on, not the kind that weighs down the lid, but the kind that’s a natural enhancement. Her skin, fresh and matte with a slight contour under the cheek bone. It looks as though she has a slight dust of pink on the cheeks and an ice mocha lip color. Ta…dah simple and fresh it is! Tamera Mowry- a little different from her twin. Tamera’s overall look is a little more formal and elegant, including her make-up. Her eyes are beautiful, a fleshtone natural like color coats her lid and a hint of a contour color in her crease. She also has black eyeliner, slightly winged out, and she is lashy! She is wearing false lashes and it enhances her classic beauty. Her skin glowing, not matte but a natural glow, almost a little sunkissed. The color peach on her cheeks and lips, matches her wedding party and add to her elegance. 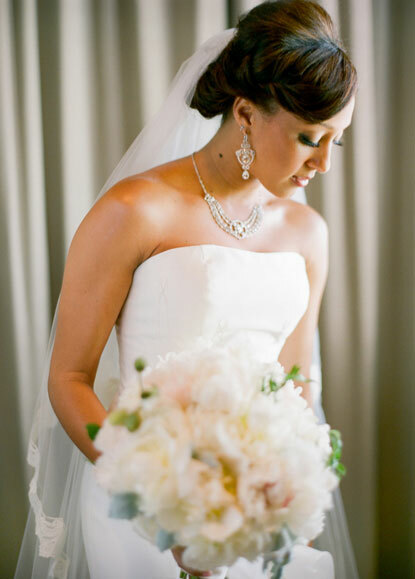 Tamera’s make-up is consider…Elegant and Fresh! Lisa-Raye looked like a goddess, with those beautiful light brow eyes, her make-up artist chose the perfect combination of colors to add glamourous eye drama. Her lids seem to be coated with a shades of purple, and blended out to a natural color with a drop of shimmer. Her eyes were lined in black, which helped to really pop her eye color and compliment the purple. She wore false lashes that added added more glamour. Her skin, seemed sunkissed and glowing, not matte at all. Her cheek and lip color a natural peachy brown, the perfect combination of colors to balance the eye make-up. Her make-up was balanced ( meaning eyes not competing with the lips and cheeks) and perfectly Glamorous! What kind of bride will you be? Part #2- Coming Soon!